I’m cooking all afternoon in anticipation of a family dinner tonight. The first fruits of my labors are in the photo below. I cultivated the sourdough starter I use for this bread three years ago — over the years, it has really developed some punch, and produces a fine, aromatic loaf. My afternoon now turns to large poultry, a country-sausage stuffing (with some of the sourdough bread as a key ingredient), various greens, beans and a chipotle-laden sweet potato dish I discovered last year. I leave it to my daughter to bring her usual spectacular salad and dessert. I want to wish all of you the best, and hope your day is going as well as mine. It’s always a privilege to write for this audience. That is an amazingly good looking loaf of bread. Thanks Paul. And to you. Cheers for a great year. Plenty to come in the next one too! All the best . Best wishes Paul to you and your Family over this festive period, and your extended family of Centauri Dreams readers. I another year is almost complete and there is plenty going on next year which I look forward to reading about on this site as always. Awesome Paul! As always, your threads are a joy to read. Sound like your cooking quite some treats. Merry Christmas to you and my fellow followers of your site! Thanks, Paul, for all the interesting and informative articles, I never miss reading one and regularly send the links to my friends. May we all have a Great and Happy New Year! Merry Christmas to you and your family Paul. Thank you for being a part of our lives…my daughters Vanna and Jackie Rae enjoy your posts as much as myself (probably more) and understand the significance of the profound ideas put forward here as best as any of us really can. Merry Christmas and a Happy New Year Paul! I’m looking forward to more great articles that you find and write about on your first rate site. Thank you. Paul, Merry Christmas to you and to those important to you. Nice looking loaf. Thanks for sharing your culinary plans with us, as an avid cook (and eater) I am often interested in hearing from other people about “what’s for dinner.” I look forward to more keen analyses on Centauri Dreams in 2015! Paul, As an eager reader of Centauri Dreams, I was delighted by this post. Is the recipe available? All the best for you and all your beloved ones. And keep up with this wonderful blog! Thanks to all of you for the kind words! And Mauro, with regard to the bread recipe, I’ll point you in that direction in tomorrow’s post. Wow! Best wishes from your admirers (including myself and associates ) on this side of the ‘pond’. We look forward to your continuing posts in 2015. To Mauro and the others who asked about my bread recipe via email: I didn’t get a chance to post anything today, but I can go ahead and give you my source. For all things sourdough, I rely on Peter Reinhart’s guidance. In particular, his book The Baker’s Apprentice, which has a complete background section on how to cultivate your own sourdough and the various kinds of bread you can make with it. My basic recipe is the one he produces — and I made my starter using his techniques — but I frequently doctor it up with herbs, cheese or other things depending on my mood. 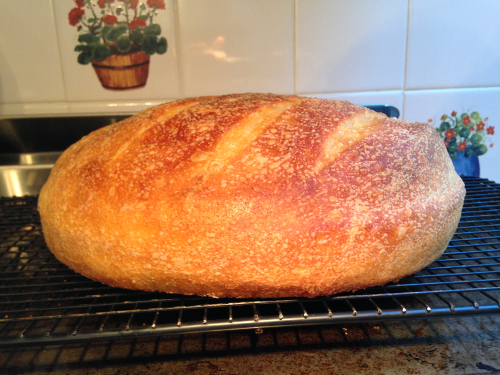 The loaf in the photo is the basic Reinhart sourdough made with King Arthur bread flour. Merry Christmas, Mr. Gilster. Thanks for all the consistently high quality content. This blog is a real celebration of intellectual culture and brings together people from across the world as one “family” of scientific belief. I’m proud to be part of such a group and enjoy the huge and varied opinions from across the world. It really warms my soul to see so many different people and cultures brought together by their love of science . Lots of reason for hope and I’ve certainly learned a enormously from the blogs but also the extensive , varied and informed knowledge expressed from across the globe. The Internet at its best. Just as no amount of great directing and acting can save a bad script, if you aim for the stars, you may never get there, but if you don’t, you certainly won’t. Merci infiniment pour ces bons vœux, excellentes fêtes de fin d’année à vous également ! Merry Xmas and a Happy 2015, Paul. Let’s hope there’s wonders ahead this year – Ceres in March, Pluto in July and who knows what else? Happy holidays, a Happy New Year and my hearty thanks to Paul G. and all the thoughtful commenters who make this one of my favorite blogs of all time. Previous post: An Internal Source for Earth’s Water?